Rents mobile home (28m2 with 2 bedrooms including 1 parental 1 bed 2 places and one of 2 separate beds possibility of bringing them together-living room equipped kitchen with reversible air conditioning, tv, fridge freezer, electric bbq, toilet and separate bathroom + terrace 30m2 covered equipped dining area) in 3 * family camping with heated pool, restaurant, wifi, playground, trampoline, sports equipment, bike rentals quiet in the upper Var (Verdon Natural Park) near the lakes of Artignosc sur Verdon, Quinson, Ste Croix, Esparron. Ideal for swimming, fishing, water sports, mountain biking, hiking. Possibility to provide you with an inflatable kayak 2 people. 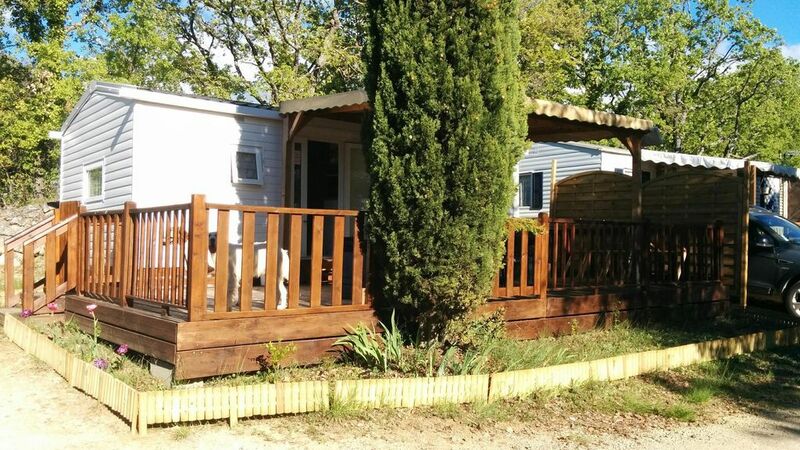 Near village 3km and large area 10km, surrounded by villages and typical Provencal markets to visit. Natural park of Verdon, canoe kayak, water sports, markets and Provencal villages, Valensole plateau with lavender fields, museums, cycling, hiking. Un contrat type de location vous sera envoyée par mail pour toute réservation.